Employers encouraged their workforce to sing, play musical instruments and to join orchestras or bands. The Victorians are well known for their strict moral code and they believed that the discipline of practising on their pieces every night, encouraged dedication and commitment and that being part of an organisation would encourage people to work together at work as well as in their own time. 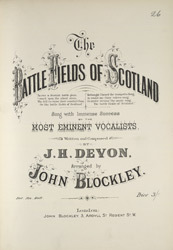 Lyrics were also thought to be educational, here people can discover Scotland's history whilst enjoying the music at the same time.